There's a reason AMC pushed "Rick Grimes' Final Episodes" so heavily last fall — for eight full seasons and five episodes, Rick was at the center of almost everything that happened in the Walking Dead universe. When he was taken away via helicopter after the fateful bridge explosion, it became clear that it was the end of an era for the show. But later episodes, by virtue of their existence, seem to pose an important question: Did The Walking Dead need Rick? Certainly, he was an important character to the story, but the show has continued and introduced some interesting new antagonists without him ... though, on the other hand, his absence is surely felt. Here are some of the reasons we think Rick should've stuck around, and some reasons the show is just fine in his absence. YES: He provided a focal point for the narrative. Simply put, this was — in a variety of ways — Rick’s show. The first character we saw was Rick, we learned about the apocalypse through Rick’s eyes, and we came to care about certain characters and despise others based on the way they treated him and his family. Though other characters have certainly had well-deserved time in the spotlight, Rick was basically the point around which everything in TWD orbited. There’s no shortage of shows on TV today that feature ensemble casts and use their variety of characters well. But sometimes it’s helpful to have one main character on which to focus the audience’s attention, and Rick was a good character with which to do that; by virtue of the fact that he was just a regular guy trying to protect his family, he was appealing and relatable enough to a large quantity of viewers without being boring. With him gone, it’s hard to find another character that has that kind of universal relatability on the show. NO: Other characters are just as interesting as Rick was. But who needs relatability? Truly, if the characters are compelling enough, it often becomes less important that viewers can fully see themselves in them — they simply need to be invested enough in the characters' journeys to continue watching. 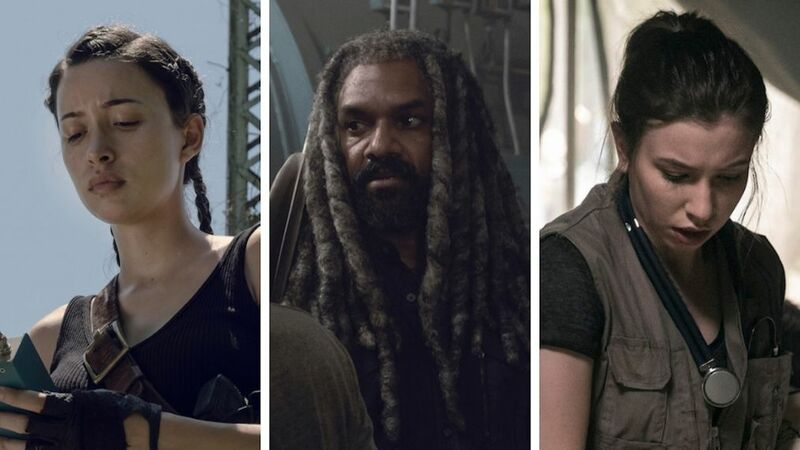 On this show, there’s no shortage of interesting survivors worth sticking around for; Michonne (who will be leaving after Season 10), Daryl, Carol, Ezekiel, Maggie (if Lauren Cohan returns), etc. In each of them, Rick’s individual qualities can be found, perhaps most notably in Michonne, who wants to protect her family and carry on Rick’s legacy. Furthermore, these characters each have unique places in the narrative and powerful arcs that make them every bit as interesting as — if not more interesting than — Rick. While Rick’s evolution should never be discounted, Carol, Daryl and Michonne’s separate odysseys and struggles to maintain their humanity are equally strong. YES: He’s still with the group in the source material. Rick’s absence from the show is the largest diversion the television counterpart has made from Robert Kirkman’s source material, or at least on par with Carl’s death. Though Rick’s still alive and well in the larger Walking Dead cinematic universe, it seems likely he won’t be getting the same storylines as his comics counterpart. With such a large change from the material on which the show is based, several writing challenges emerge for the staffs of both TWD and whatever Rick Grimes spinoffs are in the works. The crew on The Walking Dead will be faced with either using material from the comics and factoring out two of their most influential characters, or giving those comics arcs to other people, or doing away with the source material altogether after a certain point, a la Game of Thrones. Meanwhile, the staff on the Rick Grimes movies will be faced with writing an authentic version of Rick that remains true to his character while also placing him in situations his character never explored in the original story, with characters he never met in the original story. If the show had kept Rick where he was, those challenges would have been eliminated. NO: Not following the comics has opened new storytelling avenues for the show and for Rick. On the other hand, perhaps it was time for TWD to emerge from the shadow of its source material. After all, it was the show’s sluggish devotion to the All Out War storyline that made Seasons 7 and 8 tough to get through at times, and rather slow at others. If The Walking Dead jettisons certain aspects of the comics, or at least adapts them in a unique way, it might get some of the early-seasons momentum back (though Season 9 has been doing a fine job of that so far). Stepping away from the source material might be a good thing for “Officer Friendly,” too. There’s certainly nothing wrong with the Rick in the comics, but removing him from Alexandria and the united communities certainly gives a unique opportunity for facets of his character to be explored that would have otherwise gone uncharted. The movies can pose unique questions for his character and answer them in a totally new way, similar to how Fear The Walking Dead was free to pose and answer different questions about the initial outbreak and post-apocalyptic life outside the United States, since it wasn’t bound by source material. Giving Rick the Fear treatment might be the best thing for his character in order for him to remain compelling after nine seasons of growth. And more pics from the new season. YES: The Walking Dead was largely Rick’s, and his family’s, story. When AMC was advertising Rick’s final episodes, it was almost as if the channel was promoting the end of the show — and in a way, maybe it was. Until the end, Rick’s goals were centered around his family; around finding them, around keeping them safe, around building a better life for them that wasn’t just about survival. Though these philosophies can certainly be adopted by other characters in that universe, they’re probably best known as Rick’s mantra, and in that way The Walking Dead was Rick’s story. At the end of the day, Rick was front and center for every conflict the survivors faced. He went up against the Governor, he led his group into Alexandria and fought back the horde that flooded the gated community, he fought against Negan. NO: The Walking Dead has evolved beyond one man’s journey. Though The Walking Dead certainly started as one man’s quest to find his family in a world lost to the dead, it has since revolved around much more than that. Other characters have conflicts that are equally important and make for just as good of a story, and removing Rick from the equation has allowed them to develop. Side characters who hadn’t been getting consistent attention — characters like Aaron, Tara and Father Gabriel — have been given stronger storylines with actual conflict. Whether that could have been done with Rick around is debatable, but with him gone, it’s nice to see them finally getting some screentime. AMC Networks' linear and streaming services had a lot of big news at TCA.